Amanda Murphy Design: Giveaway Day at Sew Mama Sew! Note: The winner of this giveaway is Tammy, who loves peanut butter cookies and homemade fudge. And guess what - you all have put me at well over 1000 Facebook followers/"likes" (and made me very hungry with your cookie ideas) so THANK YOU! Happy Holidays! Guess what? Today is Sew Mama Sew's Giveaway Day and people are giving away all sorts of great fabrics and sewing supplies. To enter simply leave me a comment on this post telling me what your favorite holiday cookie or treat is. And please hop on over to my Facebook page and "like" it if you have a chance - I'm close to getting 1000 followers and we'll be making some cookies of our own to celebrate once we reach that goal! The deadline to enter is midnight on Friday, December 13th. Thanks for the chance to win - it looks like a gorgeous prize! What a wonderful giveaway! I love sugar cookies, easy, fun and delicious. :-) Thanks for the fun! English toffee squares - delish! For me it has to be Christmas cake - I wish I could have it all year round! Mince pies, Christmas cake, and cadbury chocolates....my mouth is watering now! Thanks for the giveaway. 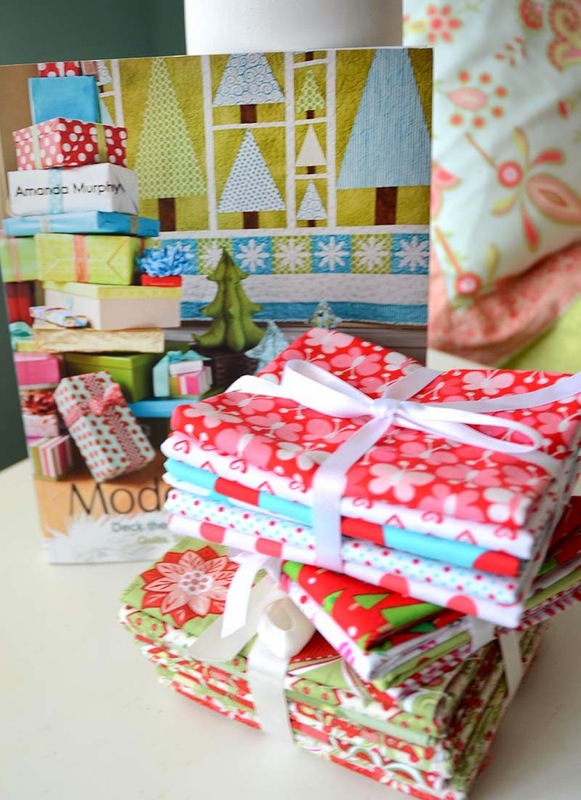 love those fabrics and would love your book - thanks for the giveaway - my favourite christmas treat is pavlova ! oh and I liked your facebook page too ! Mojito Cheesecake made with a ginger biscuit bake...delish! Thx for the giveaway! Southern Comfort Vanilla Spice Eggnog...yum! Wintery white chocolate chex mix :) Nomnomnomnom. My grandmother's fruitcake recipe... even people who hate fruitcake love this fruitcake, it's to die for and it brings back wonderful memories! Thanks for the beautiful giveaway! Peanut butter cookies with a chocolate kiss in the center....yum! Sugar cookies,Fudge and Buckeyes.... the list goes on and on :) Thanks for the chance to win! Thanks so much for the chance! I love peanut butter cookies with hershey's kisses in the middle - yum!! My favorite holiday treat (and gift) is white chocolate peppermint bark...yummy, and so easy to make. Hi Amanda, I watched you today on The Quilt Show....Thanks for showing how to do the inverted binding corner ! My favorite Holiday treat is Marshmellow Roll ! My mom used to make a cookie called "Gitter Cookin'" -- a slightly spiced base with jam on top. Still my favorite! Absolute favorite is Cranberry Bread. Grandma's best recipe. Not too sweet - always hits the spot. Happy holidays to you! My favorite is what we call Kitchen Sink cookies. Full of nuts and chocolate and coconut and dried cherries....yum! My favorite holiday treat is cenci (Italian) or kruschiki (Polish) -- they're basically the same cookie, but my parents grew up having them with different names. Now my father makes them at New Year's and I wait ALL YEAR for them! Thanks for this giveaway chance - this stack is so fun! my favorite is a soft peanut butter, with a mini peanut butter cup in the middle...made once a year for everyone's pleasure. Old time favorite - Chocolate Chip! Thanks for the chance to win your wonderful giveaway!